Well it's been a really busy week around here! I haven't been so swamped at work for I don't know - three years? I finally got somewhat caught up with reading all my blog friends posts today, and with my new toy, I hope to be able to keep up better on our trip to the Squash House on Sunday! What did I get you ask? 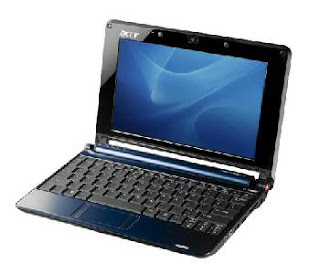 Why a little Acer Netbook! You may have seen Pam's pink cutie - and if you haven't, run right over because she and Elizabeth are having a blast at Market with hers! Mine is pretty pedestrian - black, but light as a feather and oh, so powerful! 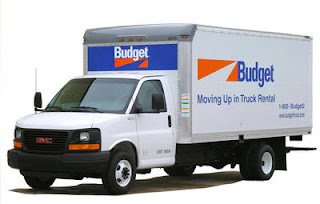 Tomorrow we pick up one of these babies - a 16 foot truck, just like you see below! We're loading it with the contents of our storage room and more stuff from the house and taking it to the Squash House to store for free! I'll be driving the truck (yes!) and Mr. Squash will drive over in the Jeep so we can have a real car to drive home. I'm planning to blog this trip every day, so unless we are totally without wireless service for the Netbook, you should be hearing from me regularly! My dad bought himself one of those little laptops when my parents were visiting. He loved it! And I have to admit, it is really cute! Congrats on the new notebook...and have fun on your trip! great new notebook, and i would love to see a picture of you behind the wheel of that truck!! Congratulations on acquiring a new laptop. This is going to be a good weekend and I am looking forward to reading your blog while you move some of your things in that truck. The new notebook looks cool and very efficient. Have a safe trip! Drive safely, post often and take pictures! Love those pictures cause they tell the story. I'm so excited for you both. How exciting to be 'almost' beginning this new chapter in your lives. We're all holding our proverbial breaths for that 'S-O-L-D' post. Congrats on the new laptop! Hope you had a good trip to the SquashHouse!